So… you are going to a party, and you want to bring a FUN family-friendly drink idea – and gift for your host? 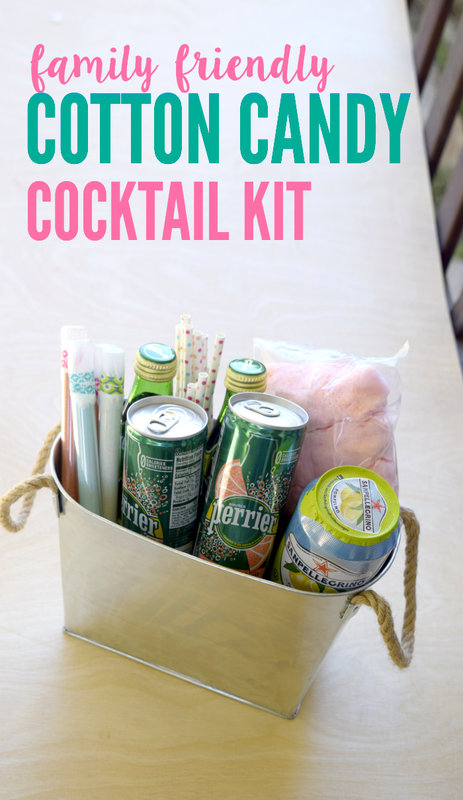 Check out this Cotton Candy Mocktail Recipe a BLAST to create and drink, and it is also the perfect hostess gift basket for the holidays!! 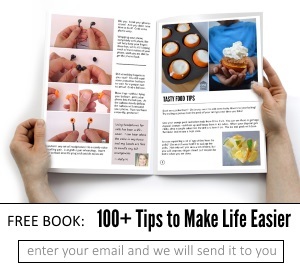 Many thanks to ReadyRefresh for sponsoring this post. They are a beverage delivery service and we got an amazing delivery including our favorites like Nestlé Pure Life and Ozarka® Brand Spring Water, as well as a couple of more festive “holiday splurge” options such as Perrier, S.Pellegrino and Acqua Panna. With a beverage delivery service I never have to fear running out of my favorites – and now with this festive gift basket idea, ReadyRefresh is the gift that keeps on giving! These cocktails are a blast to create…. and even more fun to include in a gift exchange!! Add a cloud of cotton candy to the glass. 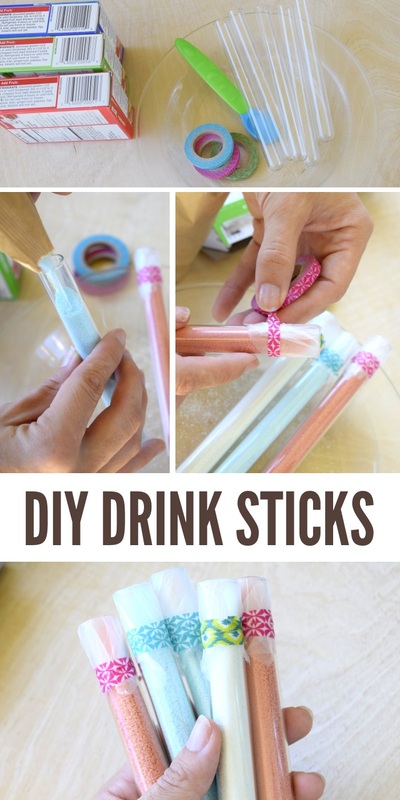 Then sprinkle on a little of the powder from the drink stick – these make it FUN. Next, pour your beverage into your glass. Our favorite flavor was the Pink Grapefruit Perrier – it was tart enough to make the sweetness of the cotton candy shine – and the best party, no added sweeteners! 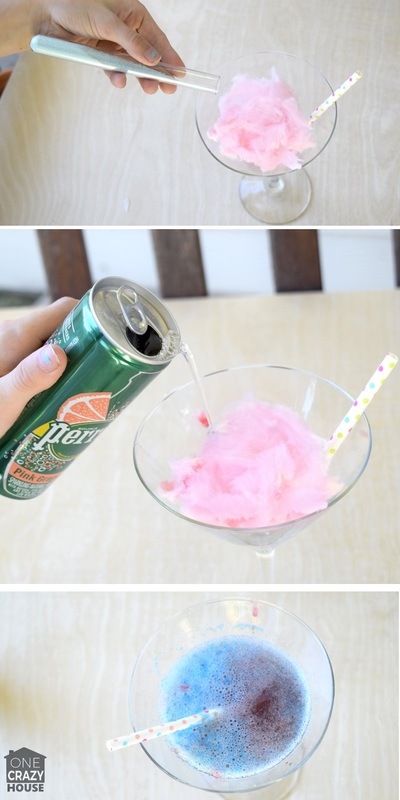 As you pour, the drink will change color and fizzle as the cotton candy melts into the glass – just YUM!! SO… What will you need to create your Mocktail Bucket?? 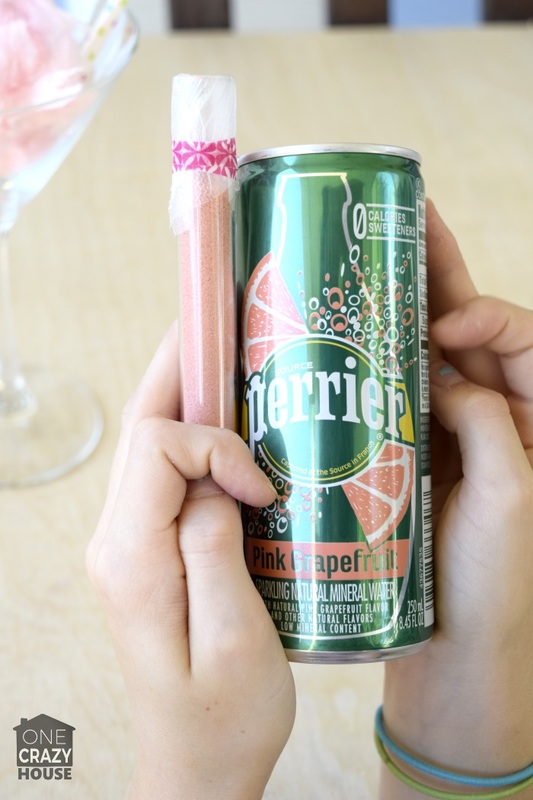 Citrus or unflavored Perrier and Ozarka® Brand Sparkling Waters – the more tart, the better!! Keeping the house stocked with the right beverages is important. I hate going to the fridge and discovering that we are out of essentials like milk, or sparkling waters!! ReadyRefresh by Nestle is always my go to beverage delivery service. Keeping my family and friends hydrated during the holidays and year round has never been easier. With a water delivery service, you don’t have to worry about running out of beverages, and you will keep your guests happy, satisfied, and refreshed. 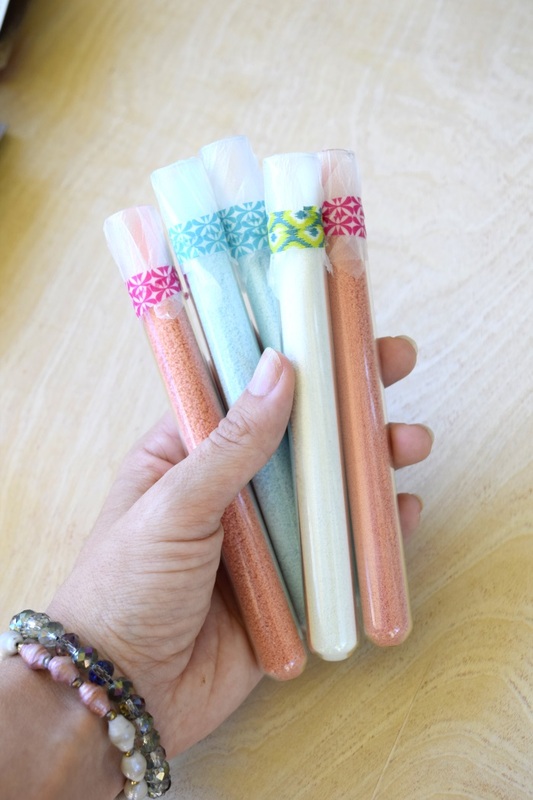 We used clean science tubes, along with small pieces of plastic wrap to seal the tubes – cause the last thing you want is a powdery mess all over your gift basket! Collect an assortment of flavored gelatin packs – we used Strawberry, Blue Rasberry and Lime. Fill each tube with the powder from the gelatin pack. Seal the tubes. We added tape to ensure that the tubes *stayed* sealed. Place the tubes, along with bottles of plain and flavored Perrier as well as cans of Sanpellegrino Sparkling Fruit Beverages, into a bucket along with a handful of straws. Maybe you don’t have time for the whole bucket gift?? 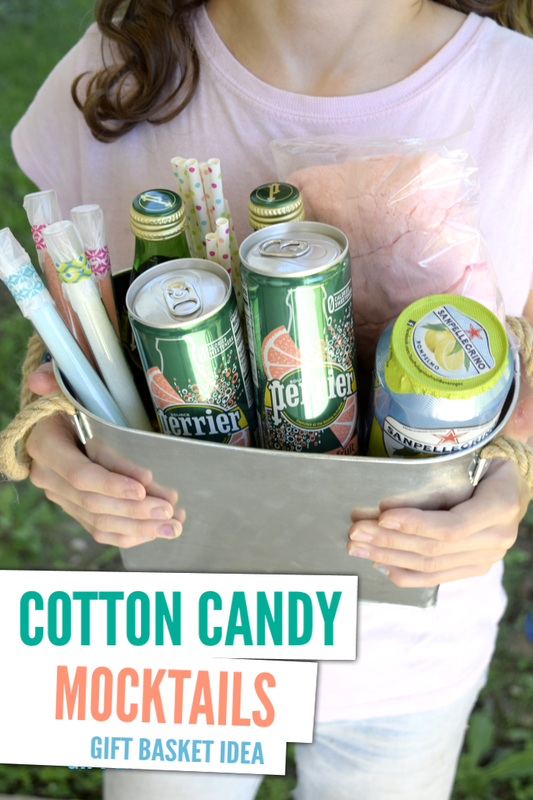 You can make and gift a smaller version – skip the cotton candy – and just enjoy the drink stick along with your sparkling beverage! We just love that ReadyRefresh by Nestlé helps keep you and your family’s hydration goals on track with a variety of flavors and options for everyone – and I don’t even have to think about it! Drinking water and staying hydrated is vital to your body’s well-being and can help maintain concentration and alertness. As ReadyRefresh is a recurring delivery service I no longer need to be a statistic – I don’t need to fear running out of my favorites – In a recent survey, 69% of those surveyed by ReadyRefresh experience feelings such as stress, anxiety and worry when household items start to run low. As your bottled water supply dwindles, you begin to hoard those last few bottles for your kids, your spouse, or even just a thirstier moment – especially during the holidays when your list of to-dos is longer than ever. This is known as the Fear of Running Out. ReadyRefresh believes that your hydration should never hinge on the inconvenience of restocking your bottled water supply. Having your favorite bottled water on hand during the hectic holiday season keeps you in control of what you and your family drink, and when. Because when you’re thirsty, you should get to drink your beverage of choice—not fall victim to the Fear of Running Out. Have you ever experienced FORO (Fear of Running Out) yourself? Join the conversation and tell us about it with the hashtag #NoMoreFORO. Avoid running out of beverages this year with $50 off your first order and free delivery of your ReadyRefresh beverage service. Learn more by following the website, facebook and twitter pages. 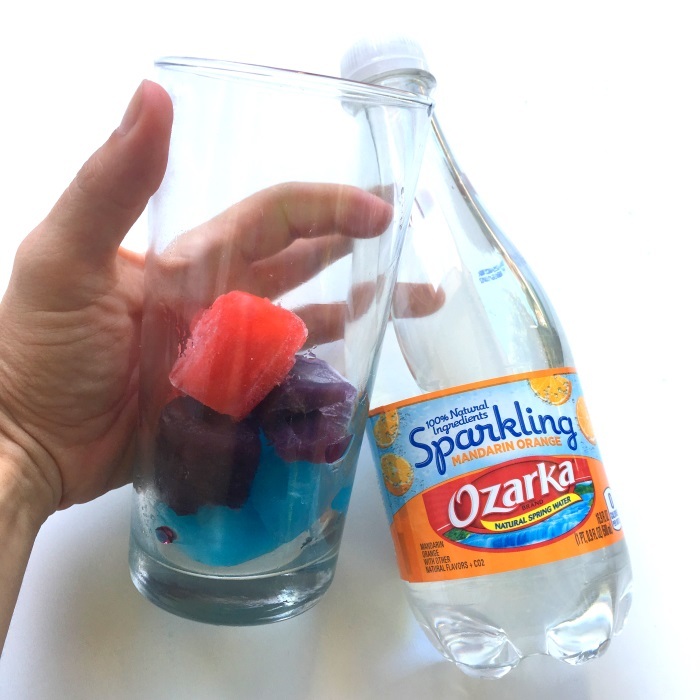 Stay tuned for our next post featuring OZARKA Brand Sparkling Natural Spring Water – with rainbow cubes!! This is a sponsored conversation written by me on behalf of ReadyRefresh℠ by Nestlé®. The opinions and text are all mine. Follow them on Facebook, Twitter, YouTube, and their website for more ideas to keep you stocked with beverages. This is a sponsored conversation written by me on behalf of ReadyRefresh by ℠Nestlé®. The opinions and text are all mine.